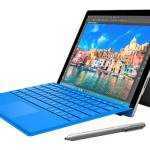 32GB SSDs are popular on some of the lower-cost Windows 8 tablets and 2-in-1’s and the new wave of $200-$250 netbooks and laptops but after the operating system is installed and the device is updated that 32GB partition can leave just 10GB free. As time goes by, increasing storage usage will eventually leave you with an unusable Windows 8 PC. To make that space more manageable there are things you can do to increase the capacity and to reduce the rate at which that space is used. Please also note that there is an important security-related caveat. Clean the drive of unwanted temporary files. 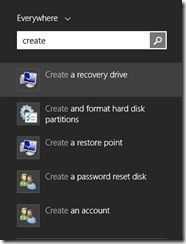 Use the Windows 8 ‘Create a recovery drive’ function to create a back-up of the recovery partition and at the end of that process, confirm to delete the recovery partition. To access the function, press [Windows-Key] and [S] and type “create”. Select ‘’Create a recovery drive” and continue with the helper. You’ll need an unused USB stick of 8GB or more. At the end of the helper you’ll see an option to delete the recovery partition. 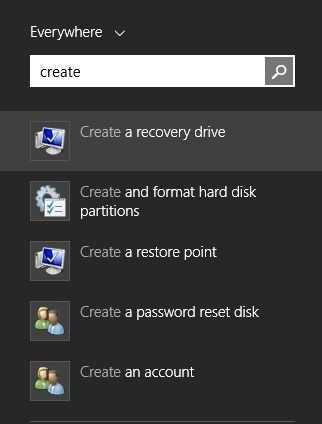 Select this option and the recovery partition will be deleted to save 4-5GB of space. 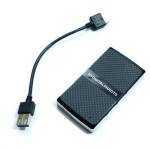 Take advantage of removable storage buy installing a MicroSD card. We recommend 32GB as a minimum for long-term usage and look for a Class 10 MicroSDHC card or, if your device supports it, a MicroSDXC card. 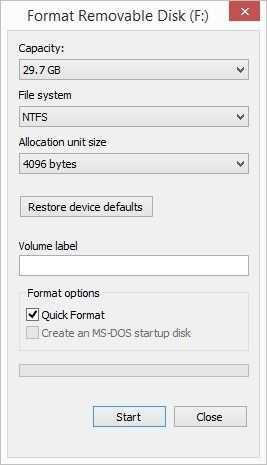 Install a MicroSD card into your Windows 8 device and format it as NTFS by right clicking on the drive in your File Explorer and selecting Format. Be careful to only format the MicroSD card! Change default location for saved files. An alternative to storing saved files to MicroSD is to store them to Skydrive. 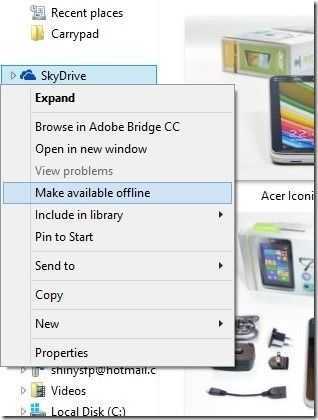 If using SkyDrive / OneDrive do not choose the option to have all stored files available when offline as this takes up space on the main drive. If you wish to have SkyDrive files saved for offline use then add a MicroSD card, make a folder called Skydrive and Move the location of the Skydrive folder. 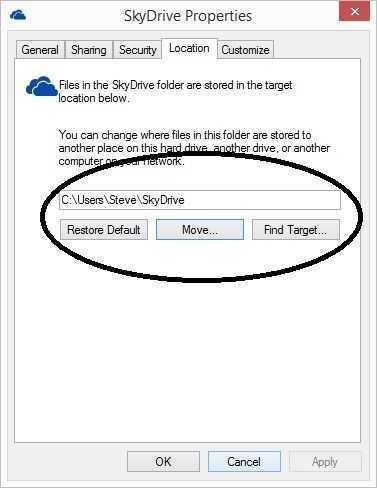 By using the same method as for the SkyDrive / OneDrive folder the location of downloads can be changed. Move the download folder onto the MicroSD card. Care must be taken with installs and the drive must be regularly cleaned using the disk tools provided. To access the Windows 8 disk cleaning tools right click on the drive in the explorer window and select Properties. From there, select Disk Cleanup. After a short while the cleanup process shows a list of file types that can be deleted and their respective total sizes. There’s also an option to Clean up system files. Click that button and wait for the analysis to complete. In the resulting tablet you can select all the options and it won’t affect the current running state of the PC. It will affect some Recycle Bin contents that could have been restored, some debug files, log files and other potentially useful files. If you have selected your files you can proceed to delete them by clicking on OK. Given that the Windows Store apps are relatively small it’s unlikely you’ll find anything huge in that list unless you’ve installed graphics intensive games or some other advanced software. Select any programs you want to delete. You can also do this by right-clicking on the program in the Start screen. 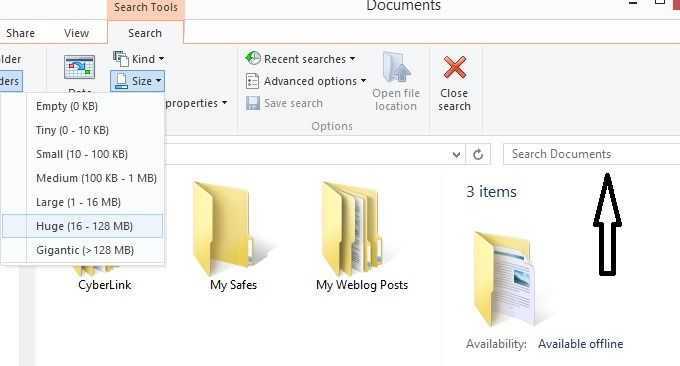 Tip: Use the Windows 8 TreeSize Touch app to track down large files. Finally you might want to look for large files you’ve downloaded or that haven’t been detected by the other methods. Take a look at Windows TreeSize Touch where you’ll be able to track down any large files. E.g. Movies and videos, large downloaded zip files etc. 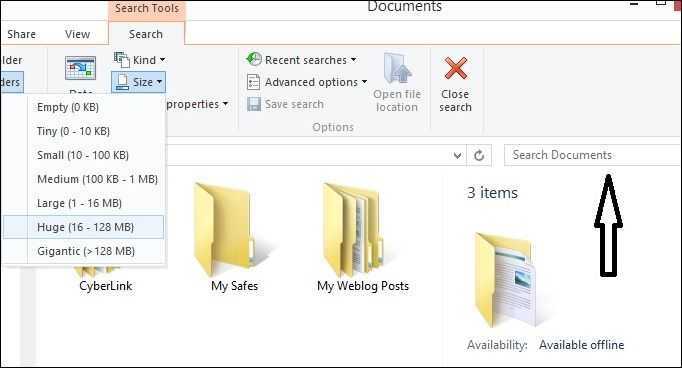 There’s also a way to do this in the file explorer by selecting ‘’the ‘Search Documents’ field and adjusting the Search Tools. Do you have any other ideas for saving space on a 32GB drive? 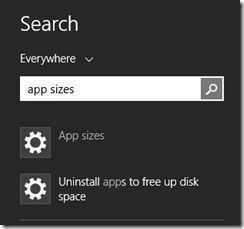 Why aren’t these space-saving features enabled by default on Windows 8.1? Preserving disk space on a 32GB Windows 8.1 device is not easy at all and Microsoft need to offer better tools for this. Ideally they would be located under the Modern UI. Even simple things like automating the view of directory sizes would be helpful. We have heard that the Windows 8.1 Update will enable to OS to run in 1GB of RAM and 16GB of storage so we look forward to seeing just how Microsoft have achieved that and whether options will be available for existing users to reduce their main drive usage. 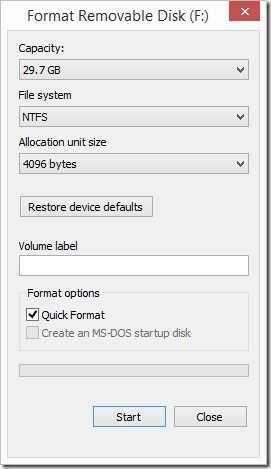 Video: Saving recovery partition to external hard drive. Is this procedure applicable and advisable for a 64GB system? Thanks. Yes, it applies to 64GB and other size drives too. 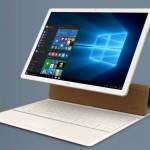 Chippy can you try to create recovery USB for Dell venue pro 8 and try to restore from there. I have heard lot of conflicting statements. I have dell venue pro 8, and I want to free up recovery portion on my tablet. But checked some forums where they say it won’t let you recover from recovery USB, as it gets stuck saying you need to have your tablet plugged in. I’ll try to test this. Maybe it needs 50% or more charge? When moving these system folders to an SD card, what kind of error and user options does Windows display if the SD card isn’t inserted? Since most of these tablets have the card exposed, I have experienced them being ejected while in my bag, holding the tablet too tight or the card accidentally getting bumped hard enough to push it in and get ejected. Also, have you tried disabling hibernation? On my Clover Trail tablet, hibernation was enabled by default. Since it’s Connected Standby capable, I disabled it and saved 2 GB of space. ‘Loss’ of an SD card doesn’t seem to trigger any errors but everything appears to carry on working as it was. I haven’t done controlled testing but I’ve certainly removed cards during testing. It’s going to take a longer period of testing to get the answers though and i’ll update this post if I see any issues here. As for hibernation, it was on my list but I didn’t want to do anything that removed features. 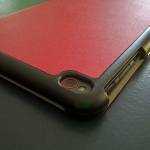 Hibernation hes helped me preserve files and state after battery loss on CS devices. I supposed one could configure the battery alarm to trigger earlier after removing hibernation capability. If you don’t have encryption enabled, you could enable NTFS compression. The compression algorithm is designed to be fast like LZO for real-time performance so the resource overhead is fairly low. You can enable it for the entire drive. Windows will automatically disable it for critical system files. I manually disable it on temp folders as well. Recovered space can vary 10%-20%. For extreme cases, I disable hibernation and System Restore. For those who find old (even current) info about disabling the page file then ignore it. 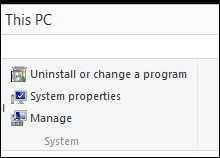 You should never disable the page file on Windows systems. …and you can’t relocate the page file either…even though Win8.1 will act like it’s permitted…upon reboot windows just recreates the page file on the C drive anyway. I will be updating this article for WIndows 10 soon but if you have any questions, feel free to ask. Will be interesting to see if and how Windows 10 has improved over 8.1 on 32GB drives. Awesome article which really, super helped me. I’m updating to Windows 10 now. Will the update be on this page, or a separate page? I can’t upgrade my 32gb Win8.1 UMPC to Win10 because there isn’t enough space on the C drive. I have done everything you suggested except remove the recovery partition. I guess that is next. WIth the Windows Update creep, over 25Gb is devoted to WIn8.1 leaving me with 900Mb free. I wish I could extend my primary partition to include my 128Gb microSD but so far I can’t… any help that direction would be a Godsend.